This page is set aside for recent news and updates related to the website and to Hellenistic astrology in general. If you would like to subscribe to these updates then please consider following the Hellenistic Astrology Website Twitter account or Facebook page. January 2, 2019: Demetra George’s book on Hellenistic astrology is now available! Ancient Astrology in Theory and Practice: A Manual of Traditional Techniques (Volume One). 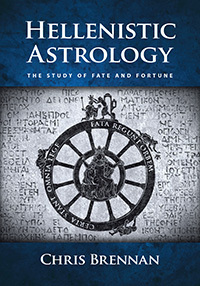 February 10, 2017: Chris Brennan’s book, Hellenistic Astrology: The Study of Fate and Fortune, was released today! It is now available for sale through our website, as well as fine bookstores/online retailers everywhere. October 20, 2015: We will be releasing a new book on Hellenistic astrology soon. More details in the near future! January 28, 2015: A free 3.5-hour lecture on the major Greco-Roman astrologers of antiquity was recently released on The Astrology Podcast. December 11, 2015: A new 18-hour workshop on zodiacal releasing has been released. November 30, 2015: A new 9-hour workshop on annual profections has been released. December 30, 2014: A new table of planetary rulerships has been added to the articles page. August 25, 2014: A new lecture on the conditions of bonification and maltreatment was added to the Hellenistic course this week, thus completing the course expansion. Since it is no longer just an introductory course, the name has been changed to The Hellenistic Astrology Course. July 23, 2014: A new lecture on the rulers of the places was added to the Introduction to Hellenistic Astrology Course. The course expansion is about 90% complete. Once it is finished it will be a 10-part course with over 60 hours of audio lectures. July 17, 2014: A proposal for a glyph for the Lot of Spirit was added to our blog. May 12, 2014: A new lecture on interpreting the domicile lord of the Hour-Marker in each of the 12 places was added to the Introduction to Hellenistic Astrology Course. February 22, 2014: A new bio on Hephaistio of Thebes was added to the site. February 13, 2014: Working on a slight website redesign. Some new links and diagrams were added to the articles page. January 13, 2014: A new 7-hour workshop on the use of the triplicity rulers of the sect light to determine eminence and fortune in the Hellenistic tradition was added to the Introduction to Hellenistic Astrology Course. December 30, 2013: A revised version of Eduardo Gramaglia’s translation of Serapio of Alexandria’s Definitions has been added to the site. December 6, 2013: A new 4-hour lecture on the Arabic Parts or Lots was added to the Introduction to Hellenistic Astrology Course. November 26, 2013: A new 13-hour lecture on the basic techniques and concepts of Hellenistic astrology has been added to the Introduction to Hellenistic Astrology Course. February 27, 2013: An important new paper on The Joys of the Planets has been posted to the site. The paper demonstrates how the joys of the planets provide the conceptual motivation for the assignment of the four elements to the triplicities, as well as the the significations of some of the places. January 7, 2013: A new translation of Paulus Alexandrinus has just been published by James Holden. January 21, 2012: I’ve been adding a number of new entries to the astrologers section of the site. Most of the articles are just stubs at this point, although I should be able turn them into more complete entries in the next few months. December 8, 2011: Check out our new article on the issue of what form of house division Ptolemy used. June 7, 2011: A new 7 hour lecture on the reconstruction of the original aspect doctrine of Antiochus, Porphyry, and Rhetorius has been posted to the Introduction to Hellenistic Astrology Course.